The interesting photo in this post features the first B-1B scheduled for use by the U.S. Air Force Strategic Air Command (SAC), B-1B Aircraft No. 2, landing at Palmdale, Calif. on May 4th, 1985 after a three-hour flight. Noteworthy B-1B Aircraft No.2 entered the SAC inventory upon arrival at Dyess Air Force Base (AFB), Texas on Jun. 29, 1985. 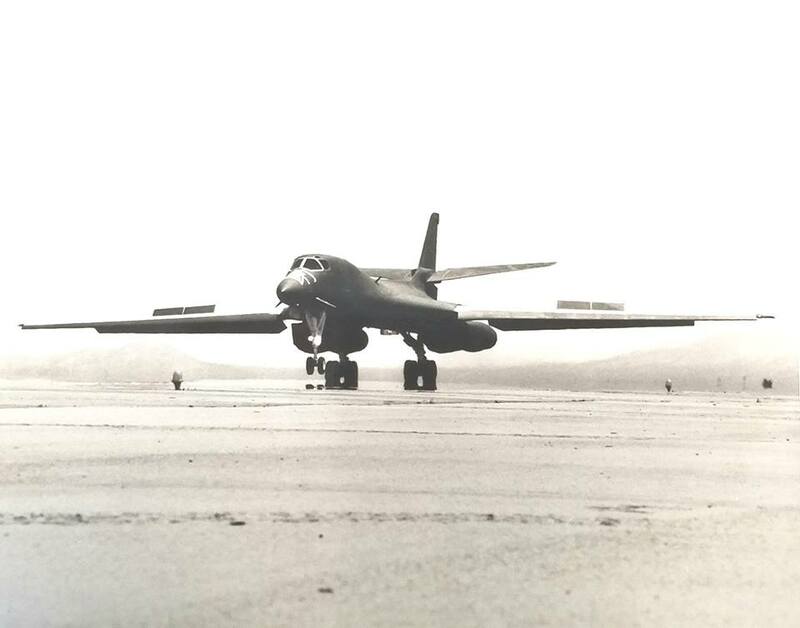 Initial operational capability (IOC) for the type was achieved on Oct. 1, 1986 and the final B-1B was delivered on May 2, 1988. The U.S. Air Force (USAF) eliminated the nuclear mission for the B-1 in 1994. Even though the Air Force expended no further funding to maintain nuclear capabilities, the B-1 was still considered a heavy bomber equipped for nuclear armament until 2007. The conversion to conventional only began in November 2007 under the original START treaty and was completed in March 2011 under the New START treaty. To make that conversion possible, two steps were taken. During the first step a metal cylindrical sleeve was welded into the aft attachment point of each set of B-1 pylon attachments. This prevented installing B-1 Air Launched Cruise Missile (ALCM) pylons. Thanks to this modification the aircraft is able to carry the largest conventional payload of both guided and unguided weapons in the Air Force inventory. Today the multi-mission B-1 is the backbone of America’s long-range bomber force: in fact it can rapidly deliver massive quantities of precision and non-precision weapons against any adversary, anywhere in the world, at any time.